Many people who are 50, 60, 70, 80, and even 90 years old feel a 30 year mortgage is not the way for them to go and that a 10 or 15 year fixed rate mortgage is best suited for them. This is a common thought as many feel they should be focusing on paying off the mortgage as soon as possible so they can live out their retirement years debt free. It makes sense. One less payment to make. But here’s the thing. If you are 50+ years old and haven’t already paid off a mortgage or have the cash to buy a house mortgage free than do you really think paying off the house now is going to make sense? Don’t worry about not getting approved on a loan if you are 50+ years old as banks cannot discriminate based on your age. You wouldn’t lend money over a 30 year period to somebody who might pass away before its paid off. But the banks will. If you know you are retiring within the next ten years and you will be living on a fixed income than its better to have the lowest possible payment versus worrying about paying the house off. A 30 year fixed rate mortgage gives you the option to keep the money for expenses. If things are going well than pay more towards the mortgage. Are you maxing out your 401k and IRA’s? If you are 50+ years old and still working it would make more sense to max those out now and take a 30 year fixed rate mortgage. If you buy a new home or refinance your current one into a 15 year mortgage than that’s less money you have to invest. Yes, paying down the house is always a smart play. But the reality is you probably do not have that many more years of working ahead of you and fewer years to take advantage of compounding interest. It’s critically important to max out your retirement accounts every year before retirement. And taking a 30 year fixed rate mortgage over a 10 or 15 year will free up more money to invest. I’d make the argument that it doesn’t matter how old you are. The 30 year fixed rate mortgage is always the mortgage of choice. It provides security in knowing you have the lowest possible payment you can to stay in the house and the flexibility to pay more and treat it like a 10 or 15 year loan. And the reason is the payments are going to be quite different on those mortgages. $125k mortgage. The going interest rate for a 30, 15, and 10 are all the same (usually the 30 year is .25% higher than the 15 and 10) at 6%. 30 year mortgage payment is $750. 15 year is $1,054. 10 year is $1,387. $1,387 – $750 = $637 a month difference in payments from a 30 and 10 year loan. $637 a month ($7644 year) is a lot of money to be taking out of one’s pocket. $1,054 – $750 = $304 a month difference between a 30 and 15 year loan. $304 a month ($3648 year) could be the money needed for utilities and groceries. When you are 50+ years old you need to make sure you have all of your savings and retirement accounts fully funded. Take out a 30 year fixed rate mortgage on any real estate transactions in the future. Do not worry about having the house paid off. Make sure you have a will or trust set up so your kids or family members have the option of keeping the same loan and the house if they want. If you set up your will or trust correctly the bank can transfer their names onto the loan and they can start paying it because it was left in the will that way. The bank would prefer you do it this way so the house does not go into foreclosure. The bank just wants somebody to pay the loan. 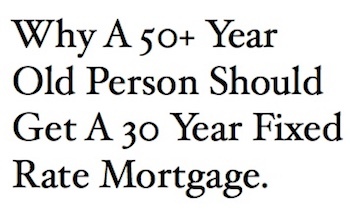 Regardless if your 50, 60, 70, 80, or 90 years old, the smartest play is the 30 year fixed rate mortgage. Need to pay off / consolidate 2nd mortgage . So I am paying only one note and one mortgage rate. Now rate are 7% & 14.75%.